LitSite Alaska has designed this section for educators teaching Seth Kantner's Shopping for Porcupine. The goal of this site is to provide an array of educational material to supplement instruction of these thought-provoking essays on life and change in the Alaskan Arctic. Chapter-by-chapter discussion questions for teachers teaching award-winning author Seth Kantner's book of essays Shopping for Porcupine. Chapter-by-chapter reading comprehension questions for teachers. A collection of assignment ideas inspired by "Shopping for Porcupine." We hope this list of potential assignment ideas will grow with contributions from other teachers. 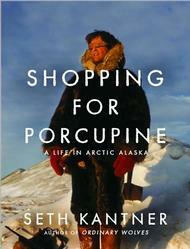 Author Seth Kantner talks about "Shopping for Porcupine." Links and related materials for Shopping for Porcupine.